Allen, Texas - Fairview Microwave Inc., a supplier of on-demand microwave and RF components, has introduced a new series of 8-bit programmable phase shifters that are adjustable over a full 360° range. These three new models can produce a discrete set of phase states of up to 256 total steps in 1.4° increments with superior accuracy and minimal phase shift error. These digitally controlled analog phase shifters cover broadband microwave and millimeter wave frequencies. They are ideal building block components for aerospace and defense radar and EW applications involving phased-array antennas, phase discriminators, beam forming networks and RF communication systems. Fairview Microwave's programmable phase shifters feature an 8-bit TTL digital-to- analog converter that allows phase states to be precisely controlled. The integrated hybrid MIC design architecture provides greater immunity to noise on control lines, delivers more uniform performance from unit-to-unit and achieves a flatter phase response over a wider frequency bandwidth with higher power handling and improved linearity performance. These three new programmable phase shifters cover frequency bands from 0.5 to 18 GHz. Typical phase shift error ranges from +/- 0.9 to +/- 4.5 degrees over 8 binary increments with fast switching speed performance from 30 to 265 nsec. Maximum input (CW) power varies from +13 dBm to +30 dBm, depending on the model. 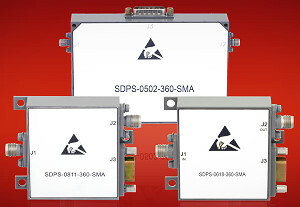 The packages are compact and environmentally sealed with field-replaceable SMA or 2.92mm connectors, and sub-miniature D multi-pin connectors for the power/logic controls. These models are designed to meet MIL-STD-202F requirements for temperature cycle, humidity, shock, altitude and vibration. "Designers can be confident in our comprehensive selection of 8-bit programmable phase shifters that deliver highly reliable operation and optimal response with extremely precise tuning accuracy that can be used for a variety of aerospace and defense applications," said Randy Leenerts, Senior RF Engineer at Fairview Microwave. Fairview's three new 8-bit programmable phase shifters are in-stock and ready for immediate shipment with no minimum order quantity. For inquiries, Fairview can be contacted at +1-949-261-1920. A leading supplier of on-demand RF and microwave products since 1992, Fairview Microwave offers immediate delivery of RF components including attenuators, adapters, coaxial cable assemblies, connectors, terminations and much more. All products are shipped same-day from the company's ISO 9001:2008 certified production facilities in Allen, Texas.